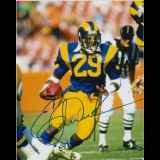 Eric Demetric Dickerson is a former American college and professional football player who was a running back in the National Football League for eleven seasons during the 1980s and 1990s. Dickerson played college football for Southern Methodist University, and was recognized as an All-American. He was selected in the first round of the 1983 NFL Draft, and played professionally for the Los Angeles Rams, Indianapolis Colts, Los Angeles Raiders, and Atlanta Falcons of the NFL. During his NFL career, he rushed for over 13,000 yards. He holds the NFL's single-season rushing record with 2,105 yards, set in 1984. New Response (Success): Had heard he was charging 10 a card sent 2 with $2..
New Response (Success): very cool talked took photo's and signed for us al..